The Turks utilize gunpowder and chemistry fully. They have every available gunpowder unit and building. Their unique unit, the Janissary, is a elite hand cannoneer and can cause massive damage. Their weakness is their lack of anti-cavalry units. They cannot upgrade to pikeman making them vulnerable to attacks from the Mongols or Franks. I would build a team of Janissary and team them up with bombard cannons. Because Janissary are neither infantry or ranged, they are good offense against any units. Bombard Cannons are slow but they can take down buildings quickly. Janissaries were musketeer warriors for the Ottoman Empire. 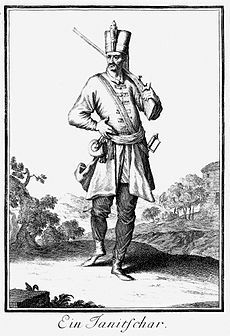 They were young boys who were stripped from their families at a young age and made to learn the customs of the Janissary. They trained profusely in the art of shooting and were a deadly force to be reckoned with outside of the empire. The Empire deployed Janissaries all over Europe and Africa where they defeated the Byzantines at Constantinople and the Mamelukes in the desert. The name Turk refers to two different Muslim groups of the Middle East-first the Seljuks and then the Ottomans. The Seljuks, nomads from the steppes near the Caspian Sea, converted to Islam around the tenth century. Approximately 70,000 Seljuks started as mercenaries to fill the ranks of the Islamic army of the caliph of Baghdad. These mercenaries converted to the Sunni branch of Islam. In 1055 they became the real power behind the caliph in Baghdad and began extending their rule. Their leaders took the title sultan, meaning “holders of power.” By 1100 they controlled most of Anatolia (taken from the Byzantines), Palestine, the lands surrounding the Persian Gulf, the holy cities of Arabia, and as far east as Samarkand. In 1071 the Seljuks achieved a stunning victory over a Byzantine army at Malazgirt in modern Turkey, which led to Turkish occupation of most of Anatolia. At nearly the same time, they successfully captured Jerusalem from its Egyptian Muslim rulers. These two events shocked the Byzantines, the papacy, and the Christian Europeans. The result was the Crusades, which carried on for the next 200 years. The Seljuk Turks were worn down by the recurring wars with the Crusaders, even though they were successful ultimately in regaining control of Palestine. They were threatened simultaneously by the activities of the Assassins, a heretical sect of Islam. Internally, Islam entered a period of introspection because of the popularity of Sufi mysticism. During this period of exhaustion and weakness, they were attacked suddenly by the Mongols and collapsed. Baghdad fell to the invaders in 1258 and the Seljuk Empire disappeared.